· In the late 1980's, Epic Records and EMI Records began releasing Donovan's music on compact disc for the first time. 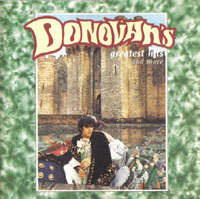 · The album's cover art depicted a photograph of Donovan taken by Karl Ferris, on the moat in front of Bodiam Castle, from the same photo session that produced the album cover for A Gift From A Flower To A Garden. · This release marks the first time that Poor Cow and Teen Angel, Preachin' Love and Aye My Love were released in CD format. · They miss the fisrt chord of Barabajagal.